The population in the Middle East and North Africa region is expected to double in size during the first half of the 21st century, with major changes in population age structure. The adolescents and youth population in almost all countries in the region will increase, expanding the share of the working-age population, with fewer dependents to support. According to a report by UNICEF, this could generate a demographic dividend: given the right investments and opportunities, the working-age population will be left with more disposable income, which can in turn spur greater consumption, production and investment - ultimately accelerating growth and shared wealth. Children and young people are a powerful force of change towards building a prosperous and stable future for themselves, their communities and their countries. Now is a historic opportunity to invest in the human capital of children and young people, enhancing their prospects for productive employment and economic growth. Investment in the health, protection and education of those transitioning into their most economically productive years – the children, adolescents and youth of today. This unique opportunity for a demographic dividend - economic growth due to demographic changes - will only present itself between now and 2040. 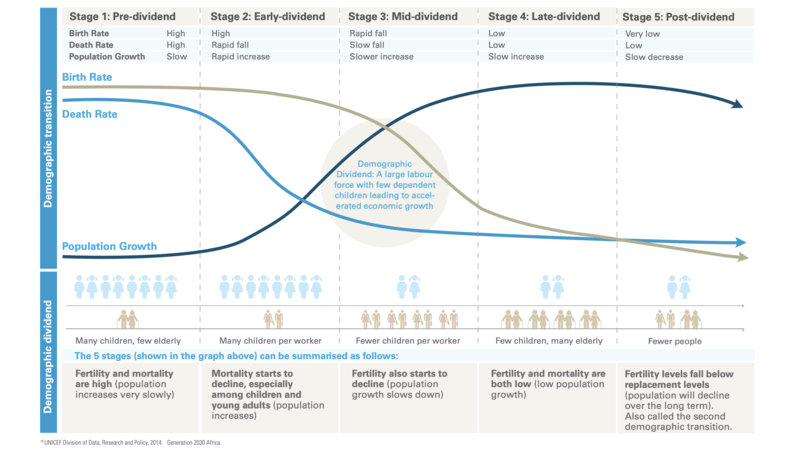 A demographic dividend does not emerge automatically – it must be cultivated. Healthy, well-nourished and well-educated young women and men, supported by inclusive policies in a climate of peace and stability, can bring unprecedented levels of growth and social progress to the region. But if we don’t invest enough in children and young people, large numbers will continue to be excluded. Conflict and instability will prevail, and demographic changes in the region will become a burden rather than an opportunity. Countries in the region are at different stages of their demographic transitions. While for some the window of opportunity for realising the demographic dividend is still wide open, others have limited time left in which to take advantage. If countries fail to invest now in their children, adolescents and youth to prepare them for and transition them into productive adult life, the unique opportunity of the demographic dividend will slip through their fingers. Action is needed now to invest in children and young people and requires the efforts, energy, resources and ingenuity of all including the private sector. This includes investments in early childhood development, lifelong learning, the transition from education to employment, unlocking the potential of girls and women, and engaging adolescents and youth in decisions that affect them. This is an appeal to the private sector to act not only out of charity, not only out of corporate social responsibility, but first and foremost from the hard-nosed economic perspective of investing smartly in order to unlock unprecedented levels of growth and advances in social welfare. Driven by the transformational impact of new technologies and data, this next generation is key to creating a new path for societal and economic advancement in the region. Both governments and the private sector have a joint interest – and a shared responsibility – in ensuring a healthy and well-educated future workforce. During early childhood, especially the first 1,000 days of life, the foundations are laid for a child’s lifelong cognitive ability. In the early years of childhood, neural connections occur at lightning speed – a speed never again achieved later in life. This process is fueled by adequate health and nutrition, protection from harm, and responsive stimulation and early learning. Early childhood development is seen as one of the most cost-efficient investments in human capital, building the foundations for a child’s physical, emotional and cognitive development. Rates of return investing in early childhood are estimated up to $17 per dollar invested – potential long-term benefits might even range up to $34 per dollar invested. Science has demonstrated that early childhood interventions are important to mitigate the impact of adverse early experiences. The adaptation of new technologies and innovations are creating new types of jobs, and a large share of children and adolescents will work in occupations that do not yet exist. This rapidly changing social and economic environment calls for new skills seemingly overnight. Skills for ‘adaptability’ – the ability to respond to new circumstances and to unlearn and relearn quickly – are increasingly in demand. How well countries cope with the demand for changing job skills depends on how quickly the supply of those skills shifts – be it within the education system itself or through on-the-job training opportunities. Currently for individuals, the private rate of return for investing in education is estimated at 9% for one extra year of schooling. Social rates of returns to schooling are even above 10% at the secondary and higher education levels. Economic returns of socio-behavioral skills – those ‘skills for adaptability’, or as we call them, ‘life skills’ – are often as large as those associated with cognitive skills. Returns to education are especially high when technology is changing – people with higher human capital adapt faster to change. Human capital also matters to societies; more educated people are more trusting and tolerant of others, and hence investment in education can lead to increased social cohesion. The transition from childhood to adulthood is not just about acquiring skills, but about their actual application – as reflected in the transition to secondary/tertiary education or the transition from education to employment or entrepreneurship. This requires a threefold approach. First, education systems have to reflect the content and skills required by the labour market. Second, learning has to include practical skills and exposure to the world of work through internships, apprenticeships or similar opportunities. Third, the private sector has to absorb the new entries into the labour force, either by creating jobs or by providing an enabling environment for young entrepreneurship. How can we create jobs for young people in the Middle East and Africa? Labour force participation of women in the MENA region is remarkably low. The gender workforce participation gap in the region is actually the largest in the world - which means the region is forgoing an important share of its human capital and constraining its economic growth. Closing this gender gap would unleash human capital and contribute to economic and social development, with vast economic growth potential. Overall, the first step to accelerating the discussion around MENA Generation 2030 is simply to ask young men and women themselves, by providing children and young people with spaces to raise their concerns and share their ideas, and by involving them in decisions that affect their lives. Investing in children and young people to unlock the demographic dividend is one area where the interests of governments, the private sector and international organizations fully align. This calls for joint action by all to invest in the region’s children and youth today to secure a prosperous region tomorrow.